A post from one of my other blogs. I remember the first time I saw her in the news, not long after Charles’ proposal and before their marriage. She wasn’t much older than I. Even so young, she was so beautiful and seemed so shy… not very comfortable being the center of media attention. But as she grew up before the eyes of the world, married her Prince, and took on the duties of a wife, a Princess and then mother, she blossomed from shy young girl to a seemingly confident and capable woman. Of course, as time went on, the world discovered the confidence was a well built facade. It was through her that the world learned, that just because fairy tales don’t always have a happy ending, it didn’t mean you couldn’t rewrite your ending, and that you didn’t necessarily need a Prince to have a ‘happily ever after’. That’s when the crumbling facade turned into real self-confidence and she really grew into the beautiful woman who is forever known as “the People’s Princess”. But through all those years, from shy young girl to confident woman, one thing about her never changed… her ingrained passion and compassion for others. That is what really caught my attention about her. This radiance about her of love and caring and compassion for those around her. She was truly a remarkably beautiful woman… inside and out. I ended up having a huge crush on her for years, But how could anyone not fall in love with her? When I heard of her death… it could not have been more devastating to me had she been a member of my own family. I was crushed. And her loss in this world still feels as it did then… the grief of the world is still felt to this day when you speak of her or her accomplishments. I’m not sure if it’s because her loss was so sudden, or if it was because she was still so young (only 36), or the utter senselessness of how she died… maybe it’s a combination of all of the above. I just know that looking backing and sensing the grief that still exists, this past 15 years feels as though it’s only been 15 minutes. And I am sure I am not the only one who feels that way. Today I remember the People’s Princess… an Ambassador of Hope for the World. 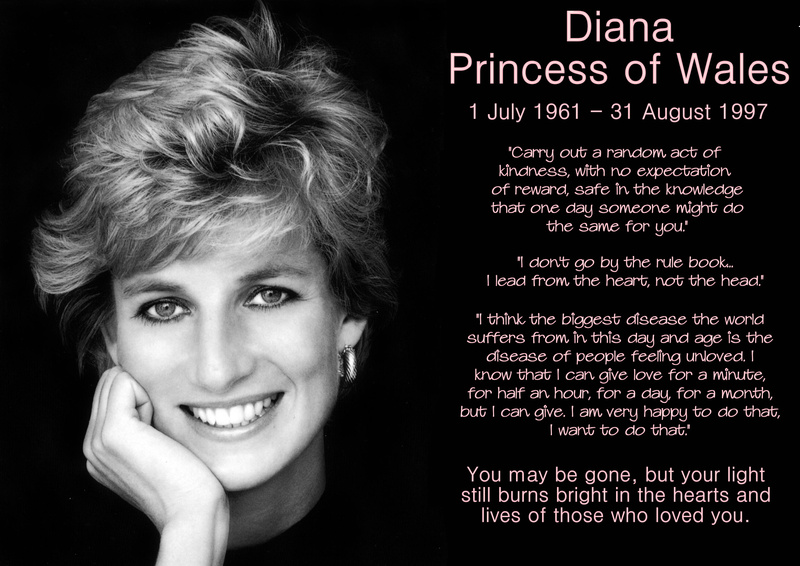 Rest in peace, Diana… you are loved and missed.